Like a real life Indiana Jones, maverick archeologist David Hatcher Childress has taken many incredible journeys to some of the oldest and most remote spots on earth. Writing prolifically of lost cities and ancient civilizations, he has produced no less than six lengthy books (the Lost Cities series) chronicling the dimly remembered glories of obscure locales from the Gobi desert to Puma Punku in Bolivia, from Mohenjo Daro to Ba'albek. We caught up with him shortly before taking off for New Guinea on yet another archeological expedition and asked him if he would be willing to write an exclusive for Atlantis Rising on the Top 10 Ancient Civilizations with Advanced Technology. He agreed to dig through his archives and give us a story. According to various esoteric sources, the first civilization arose 78,000 years ago on the giant continent known as Mu or Lemuria and lasted for an astonishing 52,000 years. It is sometimes said to have been destroyed in earthquakes generated by a pole shift which occurred some 26,000 years ago, or at approximately 24,000 B.C. Supposedly, there was one language and one government. Education was the keynote of the Empire's success, and because every citizen was versed in the laws of the universe and was given thorough training in a profession or trade, magnificent prosperity resulted. A child's education was compulsory to the age of 21 in order for him to be eligible to attend citizenship school. This training period lasted for seven years; so the earliest age at which a person could become a citizen of the empire was 28. It is said that when the continent of Mu sank, the oceans of the world lowered drastically as water rushed into the newly formed Pacific Basin. The relatively small islands which had existed in the Atlantic during the time of the Lemurian civilization were left high and dry by the receding ocean. The newly emerged land joined the Poseid Archipelago of the Atlantic Ocean to form a small continent. This continent is called Atlantis by historians today, though its real name was Poseid. Atlantis is believed to have taken technology to very advanced stages, well beyond what exists on our planet today. The sleeping clairvoyant, Edgar Cayce, in a reading spoke of the use of airplanes and of crystals or firestones used for energy and related applications. He also speaks of the misuse of power and warnings of destruction to come. Fortunately, the ancient books of India's Rama Empire have been preserved, unlike those of China, Egypt, Central America, Peru. Many of these ancient nations are now either desert wastelands, swallowed by thick jungle or literally at the bottom of some ocean. Yet India, despite devastation by wars and invasion, managed to maintain a large part of its ancient history. For a long time, Indian civilization was not believed to date from much earlier than about 500 B.C., only about 200 years prior to Alexander the Great's invasion of the subcontinent. In the past century, however, the extremely sophisticated cities of Mohenjo Daro (Mound of the Dead) and Harappa have been discovered in the Indus Valley of modern-day Pakistan. The discoveries of these cities forced archaeologists to push the dates for the origin of Indian civilization back thousands of years. A wonder to modern-day researchers, the cities were highly developed and caused leading archaeologists to believe that they were conceived as a whole before they were built: a remarkable early example of city planning. Even more remarkable is that the plumbing-sewage system throughout the large city is superior to that found in Pakistan, India, and most Asian countries today. It is said that at the time of Atlantis and Rama, the Mediterranean was a large and fertile valley. This ancient civilization, pre-dating dynastic Egypt, was known as the Osirian Civilization. The Nile river came out of Africa, as it does today, and was called the River Stix. However, instead of flowing into the Mediterranean Sea at the Nile Delta in northern Egypt, it continued into the valley, and then turned westward to flow in the deepest part of the Mediterranean Valley where it created a large lake and then flowed out between Malta and Sicily, and south of Sardinia into the Atlantic at Gibraltar (the Pillars of Hercules). When Atlantis was destroyed in a cataclysmic upheaval, this cataclysmic change in the Atlantic slowly flooded the Mediterranean Basin, destroying the Osirian's great cities and forcing them to move to higher ground. This theory helps explain the strange megalithic remains found throughout the Mediterranean. It is an archaeological fact that there are more than 200 known sunken cities in the Mediterranean. Egyptian civilization, along with the Minoan and Mycenean in Crete and Greece are, in theory, remnants of this great, ancient culture. The civilization built huge earthquake-proof megalithic structures and had electricity and other conveniences common during the time of Atlantis. Like Atlantis and Rama, they had airships and other modes of transport, often electrical in nature. The mysterious cart tracks of Malta, which go over cliffs and under water, may well be part of some ancient Osirian tram-line, possibly taking quarried stone to cities that are now submerged. Probably the best example of the high technology of the Osirians is the amazing platform found at Ba'albek, Lebanon. The main platform is composed of the largest hewn rocks in the world, the famous ashlars of Ba'albek. Some of the individual stones are 82 feet long and 15 feet thick and are estimated to weigh between 1,200 and 1,500 tons each! Vimanas and other advanced devices are said to have been in use in the Uiger area, and the famous Russian explorer Nicholas Roerich reported seeing a flying disc over northern Tibet in the 1930s. Perhaps the craft was an ancient vimana coming from a still active city using Uiger technology that exists in Northern Tibet or the Gobi Desert. For instance, the great Chinese Philosopher Lao Tzu, born in 604 B.C., talked frequently of Ancient Masters and their profound wisdom. He wrote the famous book, Tao Te Ching, probably the most popular book ever written in Chinese. When he finally left China, near the close of his very long life, he journeyed to the west to the legendary land of Hsi Wang Mu. According to the ancient Chinese, this was the headquarters of the Ancient Ones. Could this have been The Great White Brotherhood and the Thirteenth School of Mu? 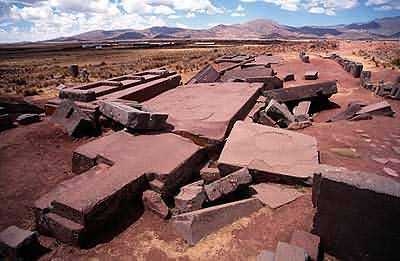 As in Mu and Atlantis, construction in South America was on megalithic scale with polygonal construction techniques designed to make the massive walls earthquake-proof. 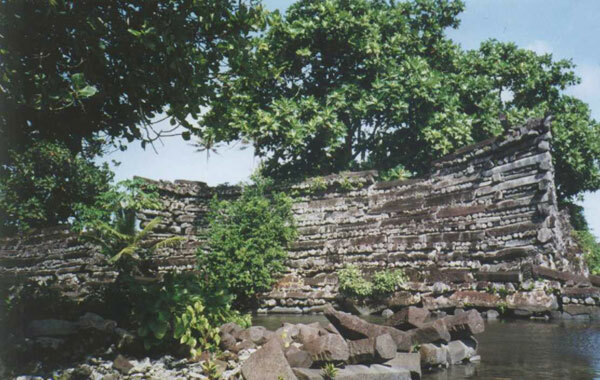 Earthquake-resistant walls were important all around the Ring-of-Fire, ancient Mu. Homes and communal buildings were built out of megalithic blocks of stone. Because of the high regard the culture had for the well being of future generations and the value they placed upon the gradual, sustained growth of the community, structures were built to last for thousands of years. A house built of cement, wood and plaster-wall will last a hundred years or so, if kept up. Witness the megalithic construction of Egypt, Malta, Peru. These buildings are still standing today. Cusco, the ancient capital of Peru, which was probably built before the Incas, is still inhabited today after thousands of years. Indeed, most of the buildings of downtown Cusco today incorporate walls that are many hundreds of years old (whereas more recent buildings constructed by the Spanish are already crumbling). Only a few hundred miles to the south of Cusco lie the fantastic ruins of Puma Punku, high in the Altiplano of Bolivia. The ruins of Puma Punku, about one mile from the famous ruins of Tiahuanaco, are massive megalithic constructions that are tossed about like toy building blocks. What kind of cataclysmic upheaval could have done such a thing? Here is the kind of megalithic construction meant to last for thousands of years, yet, the 100-ton blocks have been torn asunder by mighty geological forces. It would appear that the South American continent was suddenly and violently thrust upward during some kind of cataclysm, most likely a pole shift. A former sea-level canal can now be seen at 13,000 feet in the Andes Mountains. As possible evidence for this scenario, many ocean fossils can be found near Lake Titicaca. The lake is even inhabited by the only known fresh water sea horses. Mayan pyramids are found from Central America to as far away as the Indonesian island of Java. The pyramid of Sukuh, on the slopes of Mount Lawu near Surakarta in central Java is an amazing temple with stone stelae and a step pyramid that would match any in the jungles of Central America. As for a description of the manner of construction of the stone: we find it was a large cylindrical glass (as would be termed today); cut with facets in such manner that the capstone on top of it made for centralizing the power or force that concentrated between the end of the cylinder and the capstone itself. As indicated, the records as to ways of constructing same are in three places in the earth, as it stands today: in the sunken portion of Atlantis, or Poseidia, where a portion of the temples may yet be discovered under the slime of ages of sea water, near what is known as Bimini, off the coast of Florida. And (secondly) in the temple records that were in Egypt, where the entity acted later in cooperation with others towards preserving the records that came from the land where these had been kept. Also (thirdly) in records that were carried to what is now Yucatan, in America, where these stones (which they know so little about) are now, during the last few months, being uncovered. It is believed that an ancient Hall of Records resides somewhere in the Mayan region, probably beneath an existing pyramid complex, in an underground tunnel and chamber system. Some sources say that this repository of ancient knowledge is kept in quartz crystals that are of exceptional quality and capable of holding large amounts of information in the similar manner as a modern CD. Ancient China, known as Han China, is said to have come, like all civilizations, from the huge Pacific continent Mu. The ancient Chinese are known for their sky-chariots, their geomancy, and the jade manufacture that they shared with the Mayas. Indeed, the ancient histories of the Chinese and the Mayas seem indelibly linked. Anthropologists makes a good case for a Taoist influence coming to Central America by showing Shang dynasty symbols and motifs (the yin-yang is the most famous, but there are many more) and then relating them to known Mayan art and sculpture. Jade was of particular importance to the Shang Chinese. So far, the source of Chinese jade has not been pinpointed. Much of it may have come from Central America. Even the source of Central American jade is a mystery; many ancient jade mines are believed to be still undiscovered. The ancient Chinese are often said to be the originators of every invention from toilet paper, earthquake detectors, paper money, canons, rocket technology, printing methods, and thousands of other clever and high-tech items. In 1959 archaeologists in China discovered belt buckles made out of aluminum thousands of years ago. Aluminum is generally processed from bauxite with electricity! From such ancient texts as the Bible and the Ethiopian book Kebra Negast, we have tales of the high technology of ancient Ethiopia and Israel. The temple at Jerusalem is said to have been founded upon three gigantic ashlar blocks of stone similar to those at Ba'albek, Lebanon. Today, the revered Temple of Solomon and Muslim Dome of the Rock mosque exist on this site, whose foundations apparently reach back to the Osirian civilization. Like much of the later Phoenician construction, the building at the Temple to hold the Ark of the Covenant and the temples in Ethiopia are the last of the megalithic stone constructions. The massive Temple Mount, built by King Solomon on the ruins of earlier megalithic temple, was made to house the ancient relic known as the Ark of the Covenant. The Ark of the Covenant is said to have been an electrical generator box which housed several sacred objects, including a solid gold statue from earlier cultures that is called the Holy of Holies. This box and gold statue were said to have been removed from the King's Chamber in the Great Pyramid in Egypt by Moses during the period of the Exodus. The last of my list of ancient civilizations is that of the virtually unknown ancient culture of the Aroi Sun Kingdom of the Pacific. While the so-called lost continent of Mu sank over 24,000 years ago in a pole shift, the Pacific was later repopulated by a racial mixture of all civilizations, coming from Rama, China, Africa and the Americas. An advanced island nation, with larger areas of land than are currently in the Pacific, grew up around Polynesia, Melanesia and Micronesia. Ancient legends in Polynesia attribute this remarkable civilization to the Aroi Kingdom that existed many thousands of years before the European rediscovery of the Pacific. The Aroi allegedly built many of the megalithic pyramids, platforms, arches, roads and statues throughout the central Pacific. When some of the more than 400 gravel hills on New Caledonia were excavated in the 1960s, cement columns of lime and shell matter were carbon dated by Yale and the New Caledonia Museum as having been made before 5120 B.C. and 10,950 B.C. These weird cement columns can be found in the southern part of New Caledonia and on the Isle of Pines. The Polynesians of New Zealand, Easter Island, Hawaii and Tahiti all believe that their ancestors had the ability of flight and would travel through the air from island to island. Was this the Air Atlantis flight that stopped in Malta, Ba'albek, and Rama destined for the remote but popular convention center at Easter Island?